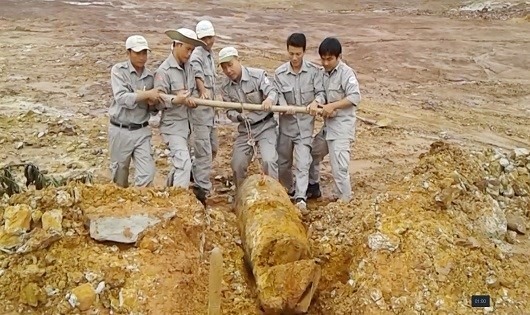 Excavation workers on Wednesday stumbled upon a 344kg live bomb at a construction site in a residential area in the central province of Quang Tri's Huong Hoa District. Peace Tree Viet Nam staff removes a bomb found in Huong Hoa District, Quang Tri Province. The workers immediately informed concerned agencies, and Peace Tree Viet Nam, the country representative of Peace Tree International, removed it safely. The bomb, buried around two metres underground, was unearthed while the site was being bulldozed for a housing project. It took experts almost two hours to remove the bomb so that it could be defused at a safer spot. Peace Tree Viet Nam said the explosive device was 1.2m long and categorised as an M117 air-dropped general purpose bomb used by the US air force. During the war, Quang Tri saw the most number of bombs dumped from US tackling planes as it was on the border separating North and South Viet Nam. Today, the province has the highest percentage of unexploded explosive devices left from the war in the country. This has also made it the province with the highest number of disabled people, a result of explosions when civilians accidentally hit bombs during farming and construction activities. For a decade now, unexploded bombs have been removed to safer places and defused, with help from international specialists.